I really can’t wait for these releases. Why? Because I love all these artists. 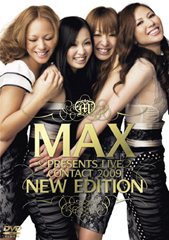 This will be the first concert tour with the original members of MAX. I hope its just as good as the last one, which was 2001? And even though I’m not really a huge fan of Lead’s new single, I do have to admit it’s pretty catchy. Give it a few days after I get my copy and I’ll probably like it. ….and SPEED, how I love thee, but do you really need to release yet ~another~ best album? I mean seriously, I would like a whole new album please. K Thanks! Here are some up coming releases from VF Artist: MAX, DA PUMP, Nana Tanimura, AKB Idoling!!! MAX will be releasing a new single 7/22/09 called, “Rough Cut Diamond”. It’s been 3 years since their last summer dance number. I’m excited for this! Mina is back and all is right with the world… well at least in the JPop world of girl bands.